Garret E. Pachtinger, VMD, DACVECC, is an associate at Veterinary Specialty and Emergency Center in Levittown, Pennsylvania, and the medical director of the trauma center. He is also a member of the ACVECC board of regents. Dr. Pachtinger lectures nationally and internationally on emergency and critical care topics and is the cofounder of VETgirl, a subscription-based podcast service offering veterinary continuing education. Feline hepatic lipidosis is a potentially fatal intrahepatic cholestatic syndrome that develops in cats in association with anorexia (of 2-7 days’ duration) and a catabolic state (ie, a state of negative energy balance). Most affected cats are obese or overweight, middle-aged (median age, 7 years), and/or domestic shorthair breed (see Suggested Reading). Hepatic lipidosis can occur secondary to another disease process or be a primary, idiopathic disease; anorexia is usually the predisposing factor. Although a simple household stressor may lead to appetite loss, anorexia can result from heart disease, kidney disease, chronic feline lower urinary tract disease, upper respiratory disease, cancer, and pancreatitis. Patients are typically presented with inappetence, lethargy, vomiting, diarrhea, and weight loss. Most cats are alert, but some may exhibit lethargy and depression caused by hepatic encephalopathy or weakness caused by electrolyte derangements (eg, hypokalemia). Common examination findings include icterus (Figure 1), signs of dehydration (eg, skin tenting, dry mucous membranes, sunken eyes, dull corneas), an unkempt hair coat, a pendulous abdomen with cranial organomegaly (ie, hepatomegaly), and weight loss often exhibited by dorsal muscle wasting. Specific examination findings may be associated with an inciting, underlying disease process (eg, abdominal pain accompanying pancreatitis, nasal discharge accompanying upper respiratory infection). CBC findings typically include nonregenerative anemia (Heinz body anemia may also be present) and a stress leukogram, which typically has a characteristic WBC differential (ie, mature neutrophilia, lymphopenia, eosinopenia). Monocytosis is less common in cats than in dogs. Serum chemistry profile findings primarily reflect cholestasis, including markedly increased alkaline phosphatase and increased serum bilirubin. Transaminases (eg, alanine transaminase) may be slightly elevated, but it is less common for a cat to present with primary hepatic lipidosis and have markedly elevated transaminases and only a mild elevation in alkaline phosphatase. Gamma-glutamyl transferase is often within the normal range (0-10 U/L); elevated levels should prompt concern for other disease processes (eg, pancreatitis). Hypoglycemia is uncommon, as >70% of the functional liver mass must be lost before hypoglycemia can occur (see Suggested Reading). Electrolyte abnormalities may include hypokalemia and hypophosphatemia; hypomagnesemia is less common. Electrolyte derangements may result from decreased intake and possible GI losses. Abdominal ultrasound typically reveals liver enlargement (ie, hepatomegaly) with diffuse hyperechoic parenchyma, hyperechoic falciform fat and renal cortices, and an isoechoic spleen. Additional findings may include pancreatitis, triaditis (ie, concurrent cholangitis, pancreatitis, inflammatory bowel disease), biliary disease, and thickening of the small intestinal tract, which may indicate inflammatory bowel disease vs lymphoma. Thoracic radiography is indicated in older patients or if cardiopulmonary disease is suspected. If a neoplastic process is suspected, 3-view chest films should be obtained. A coagulation profile, specifically evaluation of prothrombin time and partial thromboplastin time, is an important part of the diagnostic evaluation. Cats can become vitamin K-deficient in <7 days (see Suggested Reading), and, in the author’s experience, >50% of cats with hepatic lipidosis have coagulation abnormalities. Coagulopathic patients may be at increased risk for hemorrhage after invasive diagnostic procedures (eg, aspiration, biopsy). Jugular venipuncture or central line placement also may lead to hemorrhage. Without cytology, the disease may be suspected but cannot be confirmed. 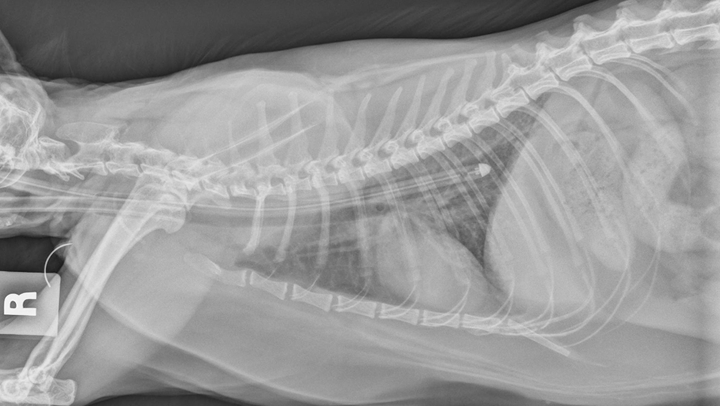 Hepatocellular lipid vacuolation is typically dramatic and diagnostic in feline hepatic lipidosis cases. The author more aggressively recommends this diagnostic approach in older patients to help differentiate ultrasound changes that may also be consistent with lymphoma, as well as for patients in which the history is inconsistent with hepatic lipidosis. Histopathology is rarely used but may be obtained for patients undergoing surgery for an unrelated reason (eg, foreign body, neoplasia). Nutritional support is the cornerstone of treatment for patients with hepatic lipidosis. Interim and emergency intervention includes fluid therapy, assessment and treatment for electrolyte abnormalities, GI support, and appropriate therapy for any underlying disease process. 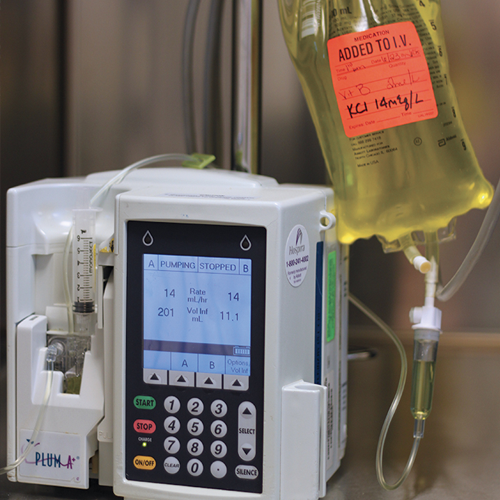 The entire calculated RER should not be given on the first day of enteral feeding. Instead, 25% to 33% is typically divided over the first 24 hours (see Suggested Reading). If this is tolerated, the caloric intake is increased to 50% to 67% of RER for day 2; on and past day 3, caloric intake can be increased to 100% of RER. Smaller volumes are preferred initially because prolonged anorexia in patients with hepatic lipidosis may reduce gastric volume and because overfeeding can lead to nausea, abdominal discomfort, and vomiting. Administration of enteral or parenteral nutrition stimulates the release of insulin, resulting in a dramatic shift of electrolytes from the extracellular to the intracellular space. Electrolytes shifting intracellularly may result in marked hypokalemia and hypophosphatemia; clinical signs include pallor caused by RBC hemolysis, weakness, vomiting, and ventroflexion of the head and neck. Figure 2 E-tube entering the left midcervical region with the patient in right lateral recumbency. The tip of the catheter can be seen exiting the oral cavity. 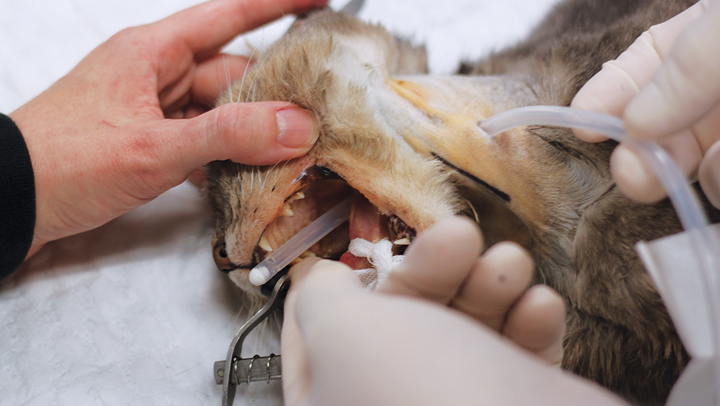 Esophagostomy tubes (E-tubes; Figure 2) are commonly used in patients with feline hepatic lipidosis. Placement requires a stable patient with corrected electrolyte abnormalities, normal cardiovascular status, and tolerance of brief general anesthesia. In the author’s experience, patients are stable for anesthesia and E-tube placement 12 to 24 hours after admission with appropriate hospitalization, treatment, and supportive care. For unstable patients, nasoesophageal or nasogastric tube placement can be considered, as these tubes are often placed without anesthesia. In the author’s experience, E-tubes allow the clinician to provide a more suitable, nonliquid diet (liquid diets often result in diarrhea) with fewer complications than with gastrostomy tubes; they also ease long-term at-home management, as owners can use the E-tube for continued enteral feeding following discharge. After the E-tube is placed, a radiograph should be obtained to ensure appropriate positioning, typically between the seventh and ninth intercostal spaces (Figure 3). Placement in the proximal esophagus may result in tube migration; placement in the stomach may result in esophageal reflux, nausea, discomfort, and vomiting. E-tubes can remain in place as long as needed (in author’s experience, typically 3-8 weeks). If intermittent E-tube feeding is not tolerated, trickle feeding may be used. Trickle feeding is performed with slow, constant feeding over a longer period of time via syringe pump or fluid pump (Figure 4) that delivers a constant infusion of enteral nutrition through the attached feeding tube. Refeeding syndrome is a rare complication that may arise following reintroduction of nutritional therapy after prolonged anorexia; it is characterized by a shift from a catabolic to an anabolic state. Assessment and correction of electrolyte abnormalities (eg, hypokalemia, hypomagnesemia, hypophosphatemia) are also important. Electrolyte assessment is crucial not only on initial assessment but also once nutrition is reintroduced. See Table 1 for electrolyte support guidelines. Ancillary therapy should focus on clinical illness as well as on any diagnosed primary diseases; for example, medications may be given for GI upset manifesting as nausea or vomiting. Vomiting is most commonly addressed with pharmacologic therapy (Table 2). Cats with hepatic lipidosis are suspected of also having a vitamin K deficiency; thus, when a coagulopathy is diagnosed, vitamin K treatment should be pursued before insertion of feeding tubes, jugular venipuncture, or hepatic aspiration/biopsy. In the author’s experience, most patients supplemented with vitamin K therapy have a corrected coagulation panel (if coagulopathic on presentation) within 12 to 24 hours. This should be documented with a blood coagulation profile (ie, prothrombin time, partial thromboplastin time). 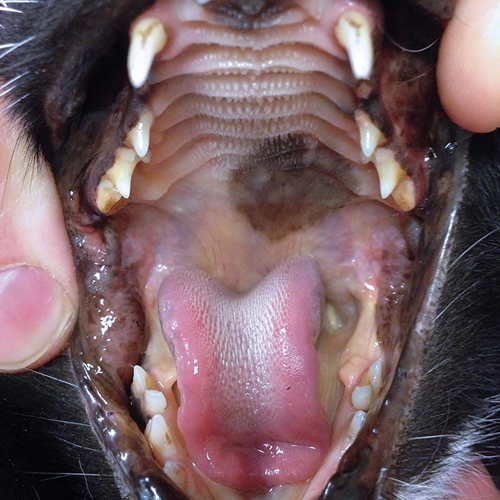 Successful treatment of feline hepatic lipidosis involves active owner involvement and education. Treatment may require weeks or months of assisted enteral feeding. In the author’s experience, more than 80% of patients can have a full recovery after successful treatment. Dimski DS, Taboada J. Feline idiopathic hepatic lipidosis. In: Dimski DS, ed. 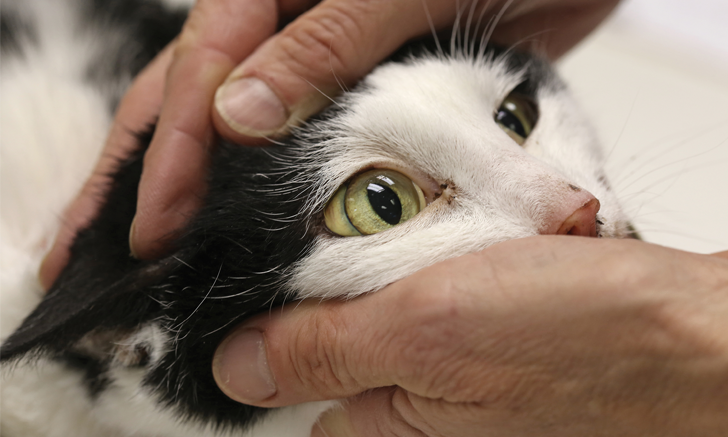 The Veterinary Clinics of North America: Liver Disease. Philadelphia, PA: WB Saunders; 1995:357-373. Simpson KW Fyfe J, Cornetta A, et al. Subnormal concentrations of serum cobalamin (vitamin B12) in cats with gastrointestinal disease. J Vet Intern Med. 2001;15(1):26-32. Armstrong PJ, Blanchard G. Hepatic lipidosis in cats. Vet Clin North Am Small Anim Pract. 2009;39(3):599-616. Center SA. Feline hepatic lipidosis. Vet Clin North Am Small Anim Pract. 2005;35(1):225-269. Center SA, Crawford MA, Guida L, Erb HN, King J. Retrospective study of 77 cats with severe hepatic lipidosis: 1975-1990. J Vet Intern Med. 1993;7(6):349-359. Gagne JM, Armstrong PJ, Weiss DJ, Lund EM, Feeney DA, King VL. Clinical features of inflammatory liver disease in cats: 41 cases (1983-1993). J Am Vet Med Assoc. 1999;214(4):513-516. Hickman MA, Cox SR, Mahabir S, et al. Safety, pharmacokinetics and use of the novel NK-1 receptor antagonist maropitant (Cerenia) for the prevention of emesis and motion sickness in cats. J Vet Pharmacol Ther. 2008;31(3):220-229. Lisciandro SC, Hohenhaus A, Brooks M. Coagulation abnormalities in 22 cats with naturally occurring liver disease. J Vet Intern Med. 1998;12(2):71-75. Simpson KW, Michel KE. Medical and nutritional management of feline pancreatitis (abstract). Proceedings from the 18th ACVIM Forum; Seattle, WA; 2000:428.